I’ve reached the final stages of this my final pregnancy. I’m big and round and the baby is fully developed and everyday is spent just fattening her up. I’ve got less than a month to my due date and I’m at the point where I’m ready whenever she is (actually, if she is anything like her brother, I am and will be ready long before she is). I think there is a natural inclination to turn inward a bit in these last days/weeks. Part of it is probably feeling like I’m spending so much time just being aware of my physical self: the aches and pains and twinges and contractions and the wonder “hmm, will today be the day that I have a baby?”. The other part is wanting to savor these last days of our band of three. 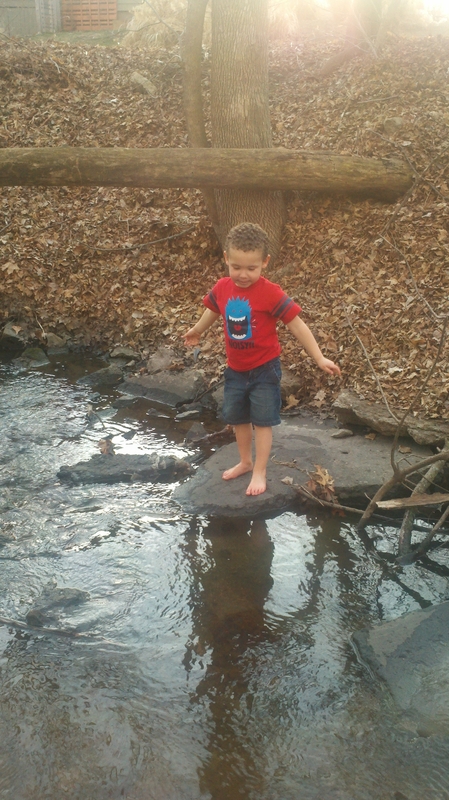 I was walking with the kiddo down to the creek by our house last week and it occurred to me that he’ll likely have no real memory of these days before his sister arrived, of the time we spent just the two of us, throwing rocks in the creek and talking about dinosaurs and robots and robot dinosaurs. It makes me a bit sad even though I think his life will be richer for the experience of growing up with a sibling (he already has siblings of course, but they are already grown so this will be a much different relationship for him). I just love this kid so much.